Our Planet, Netflix's latest docuseries produced in parternship with the filmmaking crew behind other notable Planet-affiliated shows, cuts straight to the chase: Earth is hurting, and it's only getting worse. Climate change is destabilizing our ecosystems and affecting the planet in more ways than we can even comprehend, and Our Planet doesn't mince words in its call for us to act now or lose it all forever. The underlying tone is certainly dire, but in showing us in pixel-perfect HD exactly what's worth saving, there's still the familiar sense of awe in narrator Sir David Attenborough's voice (the same one soundtracking the Planet Earth series) as we visit remote locales like the desert oases where all kinds of species hang out and socialize, or zoom in on the small but mighty power of tropical ant colonies even as one of their own is infected with beautifully disturbing fungal spores. But the most affecting moment of the series doesn't focus on an animal at all. Coming in the finale of the first episode, titled "One Planet," we travel to Greenland to witness the terrifying power of a collapsing glacier, called a calving event in scientific parlance. 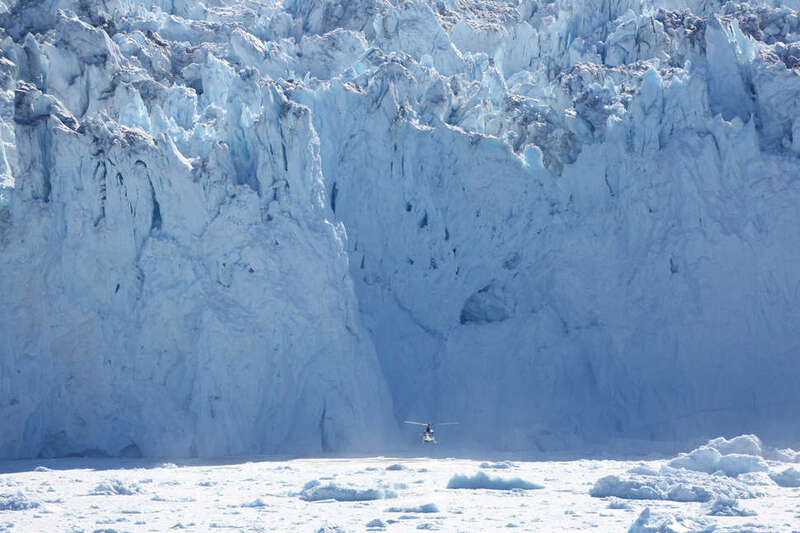 "We knew a glacier calving was something we wanted to film because of the incredible importance of those events in terms of telling the story of the threats that are facing the planet as a whole," veteran nature documentarian Adam Chapman said. And the ripple effects of the ice falling from the glacier are harrowing, even if they're not immediately apparent; we see the tsunami-lite waves, but we don't immediately witness the corresponding ocean-level rise that comes when ice falls into the sea. Like a finely tuned watch, every little cog in nature's systems matters. Thrillist spoke with Chapman, who directed the episodes "One Planet" and "From Deserts to Grasslands" and spent four years working on Our Planet, to learn exactly how his crew was able to capture one of the most extraordinary and terrifying events in nature that's only going to happen more frequently as the planet warms. The perfect shot almost never came at all. Like all nature documentaries, the most affecting sequences are the result of patience from film crews who sometimes have to make multiple location trips or accept that their dream shot will never come together when they want it to. Chapman's team spent three weeks in Greenland on the ice face waiting for that moment, and it wasn't until the eleventh hour -- late afternoon on the last day of shooting -- that something... happened. "I was pretty much thinking we'd failed, we weren't going to get this event," said Chapman. "And then the glacier started making the most extraordinary rumbling bass sounds, almost coming through the ground to us where we were waiting, and we realized this huge event was starting." That's when the crew sent up their helicopter with a gyro-stablized camera attached, and started rolling two cameras set up on the ice face. Being there in person was (predictably) breathtaking. 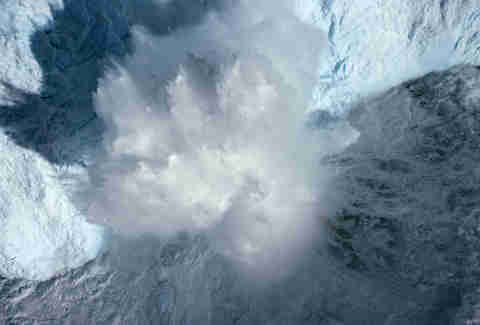 After the growling sounds, the glacier calving that we see in Our Planet began. 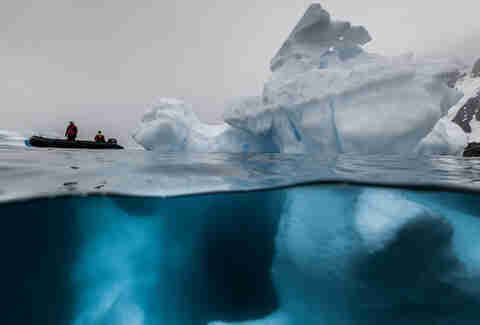 But there's plenty more happening in that event than what Chapman and his team were able to capture on camera -- more of the glacier actually lives underwater than what we can see above the surface. "All of that ice that’s resting on the seabed tilts up and comes shooting up," Chapman explained. "So as it comes up through the water, it's like an ice cube in a glass of water; it actually comes up and out of the water. At one point in the helicopter, we were pretty much craning our necks upward, seeing this huge, huge amount of ice rising up in front of us. Then it twists and turns and tears itself apart, this enormous block of ice breaks up. It was, it was the most spectacular thing I've ever seen." The aftermath was just as amazing. When you witness something as spectacular as Chapman and company did, sometimes the magnitude of it doesn't sink in. That wasn't the case here. "There was a moment after we’d landed the helicopter where we realized what we managed to film," Chapman said. "There was a great sense of relief and excitement in the team. We then walked down to the shoreline, and the whole bay was just thick with ice. It was like you could walk across the whole bay on this thick layer that had ice broken off, and there was this massive iceberg resting out in the middle of the fjord. Everyone went completely silent. The reality of what we'd just seen really sank in. But these are all events which are going to accelerate and become more pronounced, and the threat they pose should really not be underestimated." The scale of it is incredible. That glacier is massive, obviously, but it's hard to deduce exactly how big it really is when you experience it on a TV screen, aside from the tiny dots that are birds foregrounded the glacier's collapse. 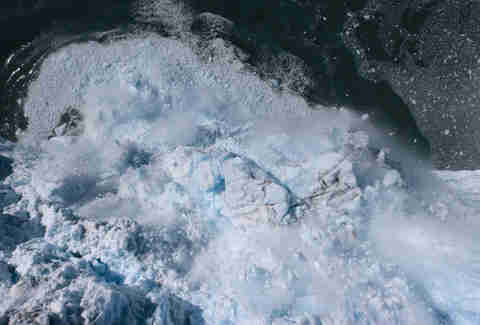 As Attenborough describes in the episode, however, that chunk of ice is akin to a skyscraper, and shed 75 million tons of ice in a calving event that lasted about 20 minutes. "I must say, the scale of it surprised me, especially the huge amount of ice that came off," Chapman said. "When you look at the glacier, you can just see 100 meters of ice sticking up above the surface. And what you don't realize is there's another 400 meters underneath the water." And even though the edited sequence feels as if cameras were right there, Chapman estimates his team's two grounded cameras were about a half mile from the nearest ice face. "That's not forgetting that the ice face is something like five miles across," he added. Scientists have had their eye on that particular glacier for a while. Scouting the perfect location for this sort of event couldn't happen overnight, and luckily, the crew was working with a scientist who had been studying this specific glacier for many years. "He had gained a very good understanding of the likelihood of it having a major calving event whilst we were there," Chapman said. "And also that was the time of year when it was most likely to happen. However, quite sensibly, he would never ever say, 'You will definitely get this.' It's very much a long shot because it's a very unpredictable event." This scene is more than just an exciting moment in nature. To Chapman, this event is emblematic of the bigger picture: Our planet is all connected, despite how limitless it feels and how inconsequential and random incidents like some ice falling off a glacier may seem in isolation. "In terms of the systems that make it work so beautifully, it's all connected," said Chapman. "You can't affect one part of it without having a knock-on effect elsewhere. The very simple things, [like] the dust that is blown from the deserts helps to fertilize the oceans, helps to provide food for all these extraordinary schools of fish and the dolphins and the birds that rely on them. And there are links, some of which we don't fully understand the cost. We really wanted to get that across -- the idea that you can't mess about with one bit and not affect another part of it."